Forget the baseball hat. It only protects the top of the head. 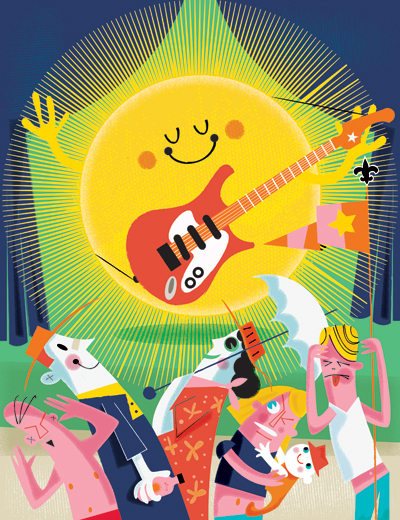 I advise broad brim hats, sunglasses and sunscreen for Jazz Fest,” says Dr. Neil Farnsworth, a dermatologist who recently opened an office on Napoleon Avenue in Uptown New Orleans. “Children as well as adults need protection from the sun’s ultraviolet rays even on cloudy days. A good hat with a wide-all-around brim provides an SPF of 7 or so before you even add in sunscreen. As for sunscreens, there’s no perfect one, but the zinc oxide based ones are the most effective” he continues. SPF are the omnipresent initials on all sunscreen products. By definition a person wearing sunscreen with a Sun Protection Factor of 20 should be able to stay in the sun 20 times longer before getting burned. The higher the number the better the protection, but SPF numbers are far from perfect. It doesn’t land with a kerplunk, but the sun continuously bombs the earth with UV radiation during daylight hours. For the New Orleans Jazz & Heritage Festival, Ground Zero is any uncovered area outside the tents at the Fair Grounds. Even on cloudy days fest-goers cannot escape UV-A, which can penetrate deep into the inner layers of the skin. UV-A is the chief culprit behind what dermatologists call photoaging – thinner and dry skin, premature skin wrinkles and dark sunspots that crop up especially on the face and backs of hands as the decades accumulate. Shorter UV-B waves are the ones that cause burns. A tan is the body’s feeble attempt to erect a barrier against nocuous solar radiation. “Think of UV-A as AM radio waves, and UV-B as the FM frequency. We get bombarded with deep penetrating UV-A all day long even when it is cloudy,” says Dr. Farnsworth, adding that the less penetrating UV-B waves are most intense midday and are the ones mostly responsible for sunburns. Sunburn from UV-B is an early win for the sun, but in the long run the sun will always win just like the house at the casino. Both UV-A and UV-B waves damage DNA by rearranging programing causing abnormal cell growths that only become evident years to decades later. The most common sun induced maledictions are solar or actinic keratoses. These red, pink and/or brown spots can progress to scaly crusts or human barnacles to squamous cell carcinomas over time, which can spread throughout the body. Common locations are the sun-exposed areas of the face, nose, tips of ears, back of the hands, and bald spots in the scalp. The most common skin cancers are basal cell carcinomas. These often appear as red to pinkish growths, bumps or scars that can progress over time into open sores with crusts. Left untreated, basal cell cancers can be unsightly and locally destructive, but they rarely spread. The most dangerous sun induced cancer of them all is melanoma. Sun damaged pigment-making cells go rogue and form malignant tumors that can aggressively spread throughout the body. Malignant melanoma can arise in younger folks through intense intermittent UV exposure (vacations or tanning beds), or in older individuals from gradual sun exposure over time. Listen loud and clear: Excess sun exposure is a carcinogen just like asbestos, cigarette smoke and multiple viruses. Most skin cancers are avoidable. Sunscreens are part of that equation. The ideal sunscreen according to Dr. Farnsworth protects from both ultraviolet waves while being easy to apply and long lasting. It should be cosmetically pleasing and not feel as though you have wrapped yourself beneath a grease barrier. After all, the best sunscreen is one that folks will use. Sunscreens have physical or chemical characteristics that help protect skin from harmful rays. The white, chalky stuff that lifeguards smear on their noses is an example of the physical barrier type. These zinc oxide and titanium oxide blockers simply sit on top of the skin, blocking harmful rays. Chemical blockers on the other hand, contain organic compounds that absorb sunrays and convert their energy into harmless heat. Most sunscreens contain a combination of ingredients for effective protection against both deeply penetrating UV-A and the more superficial UV-B. Strive for a product with a SPF of 45 or higher and don’t be stingy with the applications and reapplications. “Base tans were popular with lifeguards, but they’re ineffective in preventing sun damage. At most a tan provides a SPF of 4 or less. If a tan were a sunscreen, it would never be approved by the FDA,” says Dr. Neil Farnsworth, Farnsworth Dermatology, 2633 Napoleon Ave., 891-8004. “Dad learned his lesson the hard way. But when I was little, my parents would cover us with sunscreen. When we were older, we were on our own and less careful. My preference became just a hat. But now my wife Suzanne and I have a 2.5 year old, Frankie the V, of course, and a 10 month old. We spend summer weekends on a pontoon boat. It is half covered by a tarp that helps, but we still spray them down with a 35 SPF sunscreen. Much easier to spray than apply creams,” says Mihlon. “Be wary of sunscreens that spray on. The amount applied is almost always suboptimal. But I know what you mean. I have squirmy nieces and nephews,” says Farnsworth. A comment from the author: There is another story in this interchange. These two young doctors both broke the rule that physicians tend to practice in the communities where they do their residency and fellowship training. Hurricane Katrina and the LSU-engineered refusal to reopen Charity Hospital decimated post-medical school training programs in New Orleans. After medical school Neil Farnsworth went to Texas for dermatology training, and Frank Mihlon went to Colorado and then Duke. Both quickly returned to their home state for practice.